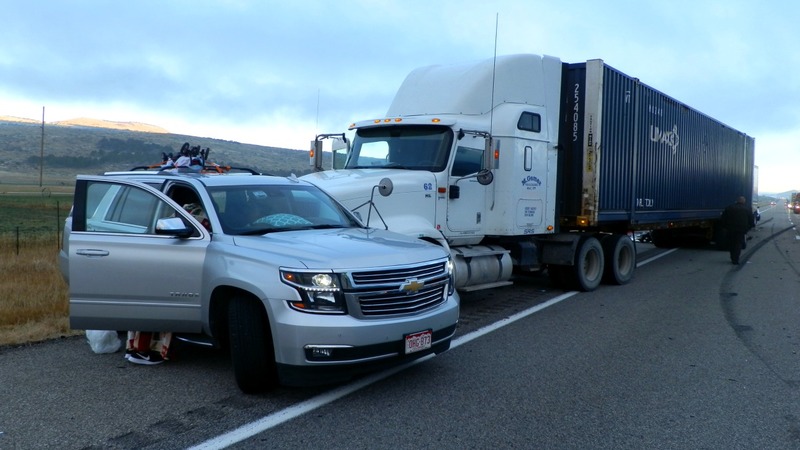 ST. GEORGE — Four occupants, two of them children, were transported to the hospital Friday after two crashes seconds apart involving three semitractor-trailers and three vehicles on northbound Interstate 15 near Fillmore. At 6:40 a.m. officers and emergency personnel were dispatched to a crash involving a semi, a white Ford F-150 pickup truck and a gray Dodge Ram pulling a a U-Haul trailer, Utah Highway Patrol trooper Nick Street said in a statement released Friday afternoon. 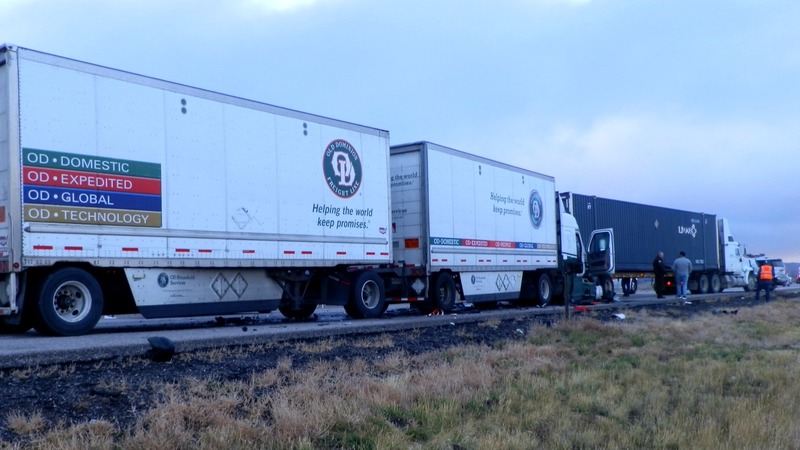 The incident was triggered when the semi traveling northbound on I-15 lost both right rear wheels of its trailer after experiencing an equipment failure. One wheel spun off to the southbound side of the highway before coming to rest in the outside lane where it was struck by the Ford, disabling the truck, which pulled off the road. The Dodge also struck the wheel, causing the truck and the trailer it was pulling to jackknife and and block the left lane. Meanwhile, a silver Chevrolet Tahoe slowed down while approaching the crash scene, as did a semi following directly behind the Tahoe. The third vehicle, a Old Dominion semi pulling double trailers failed to slow down in time and struck the semi, which was pushed into the rear of the Tahoe and left all three vehicles disabled in the middle of the right lane. Traffic was able to continue moving using the left lane to get around the three-vehicle crash scene, and then merging into the right lane to get around the initial crash. Two girls, ages 8 and 13, were transported to the hospital as a precaution after sustaining possible injury, and two individuals in the semi pulling double trailers were also transported to the hospital with injuries that were not life threatening. “Fortunately, all occupants were wearing seat belts other than the co-driver who was in the sleeper berth of the Old Dominion Semi. Otherwise, the results of this crash may have been much worse,” the statement says. Responders were able to clear the left lane within 20 minutes while the right lane was closed for nearly three hours while vehicles and debris were removed from the roadway.